Last February 15-17, most of my relatives from the father side trooped to Naga City for the long planned getaway to Caramoan Islands in in our home province of Camarines Sur. My Uncle/Ninong Albert and his family also came home from Canada so it was a great opportunity to bond with them. 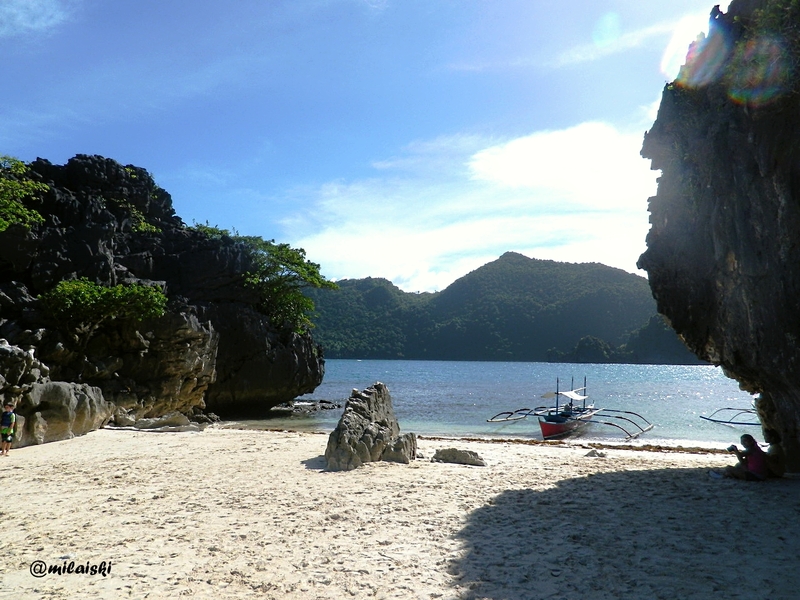 The beauty of Caramoan is quite famous in the international community and so, it is ironic that even though it’s only about two hours from my home town, I never managed to visit these past years. Finally, I had the chance to see its charms and I was quite surprised we have a paradise so close to home. 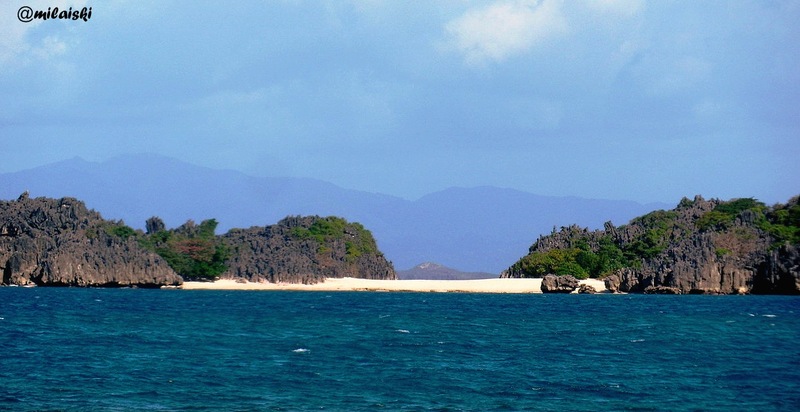 The shores of Matukad Island. We were supposed to depart for Caramoan from Naga at 6 am on the morning of February 15 so my I and my brother Miko, left Manila on February 14. We had no reservations but since it was not a peak season we had no problems obtaining seats at a Philtranco bus bound for Naga. In fact, there were just about 20 of us in the 50-seater bus so we each had a row for ourselves. We left at exactly 7:30 PM and because we still had a lot of traveling to do the following day, we just dozed to sleep. At exactly 4 AM, we arrived at the Naga Central Bus Terminal. Our family agreed to meet my paternal grandmother’s house so we immediately boarded a tricycle. Since it was still too early, Miko and I decided to sleep first while the RB, my older brother, and my other relatives were preparing their stuff. At exactly 6 am, the jeepney that will take us to Sabang port arrived. Before proceeding to Sabang, we dropped by another subdivision in Naga City to fetch Uncle Albert’s in-laws. So basically, we were two clans. Imagine the fun and the chaos! It was already 8:30 AM when we arrive in Sabang Port. We missed the 8:00 AM trip of the boat called Harry and if we were going to wait for the next trip, we will already arrive past lunchtime in Guilajo port. So, we settled to rent a smaller boat which the porter insisted was spacious for the 20 of us. 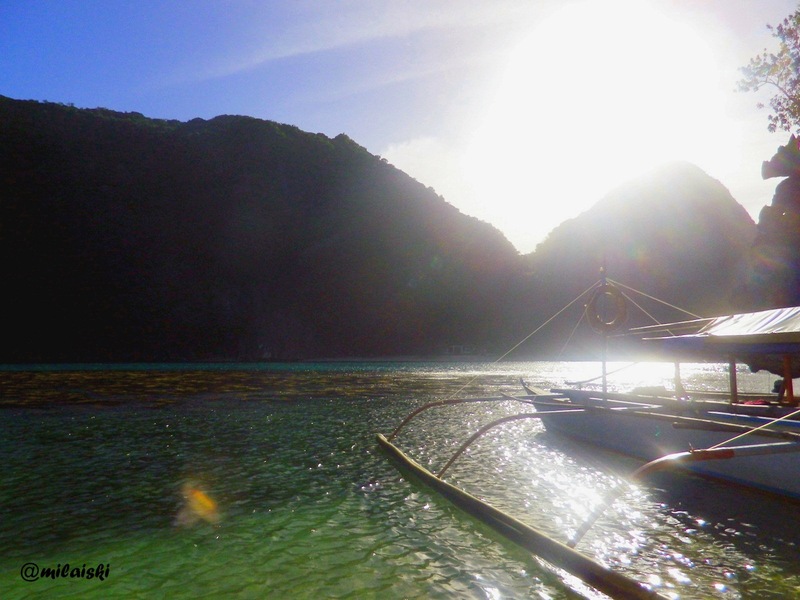 I was imagining that the porters would carry us to the boat since that was what Isaw in some of the old blog posts regarding Caramoan. Thankfully, there has been some improvements as the boats have now ramps for the passengers to step on. 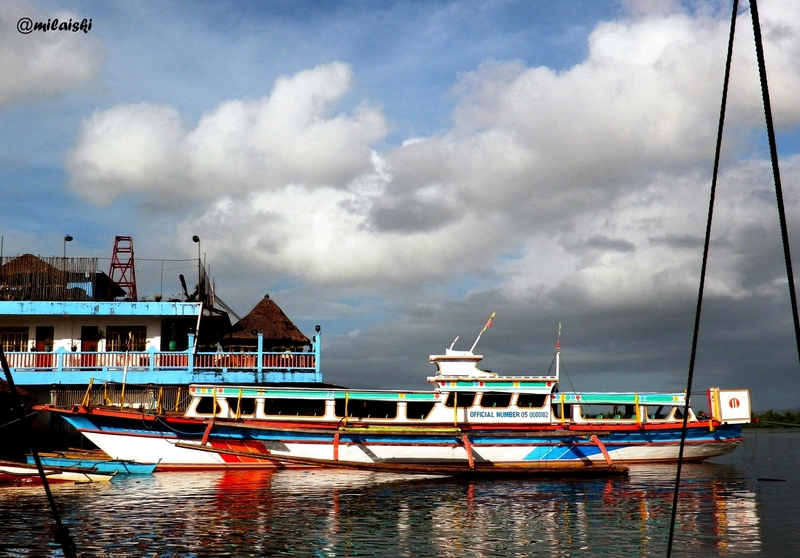 One of the boats docked in Sabang port. I was hoping for a decent boat such as the one above but to my disappointment we were given a very small boat. 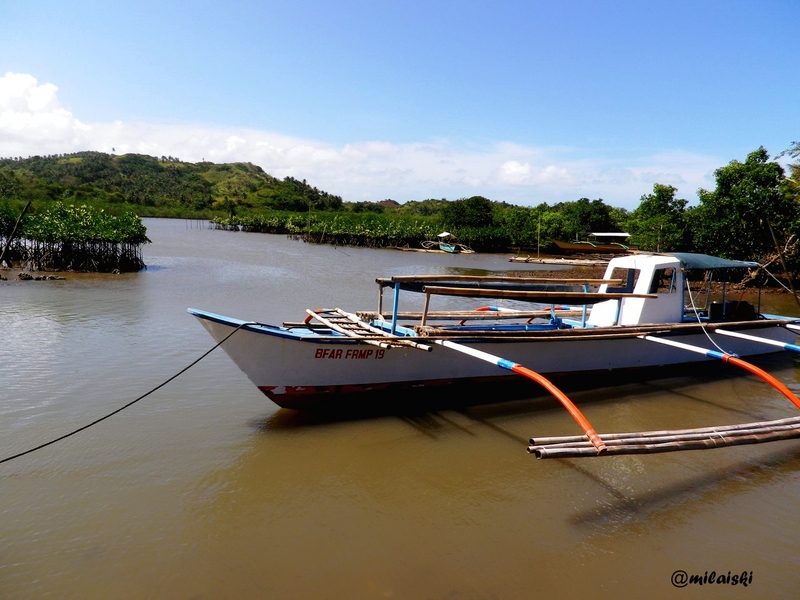 The styles of the boat in Caramoan are also not favorable for the passengers. The seats are very low in the middle and there are railings that separate the seast from the passage area. I found it difficult to fit in between the railings just to get to the seat since I’m not that really small at 5’6″. My grandmother also had a very hard time crouching down. 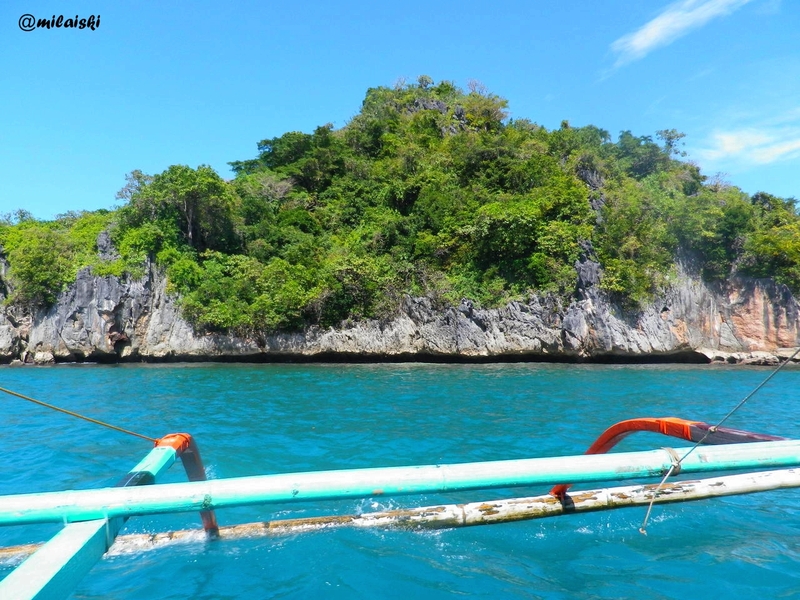 I wish the town of Caramoan would address this issue because I’ve seen and rode boats in farflung areas in the Philippines but I never had problem boarding them. Just when I thought that was the last of our problems, it wasn’t. When the 20 of us were already in the boat, the porter still let other people in because the boat has “not yet” reached its maximum sitting capacity. Que horror. Our situation was even worse then sardines in a can. A fishnet was literally on my face because I’ve been squeezed in one of the ends of the boat. We weren’t happy. Trust me. Once the passengers settled down, we finally left at around 9:00 AM. 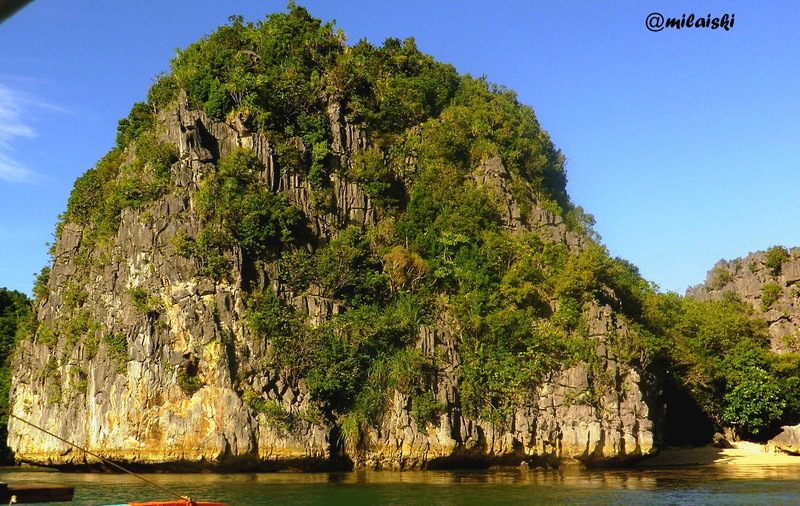 From Sabang port, Guijalo is still about a two-hour boat ride. In our case, the travel took about two and half hours because the boat was small and slow. What a lucky morning it was for all us because apart for the long travel time, the waves were also very big that day. I don’t have sea sickness and I usually have no problems traveling even for a whole day. The fact that I almost threw up meant the waves were really bad. At 11:30 AM, we finally arrived in Guijalo port. 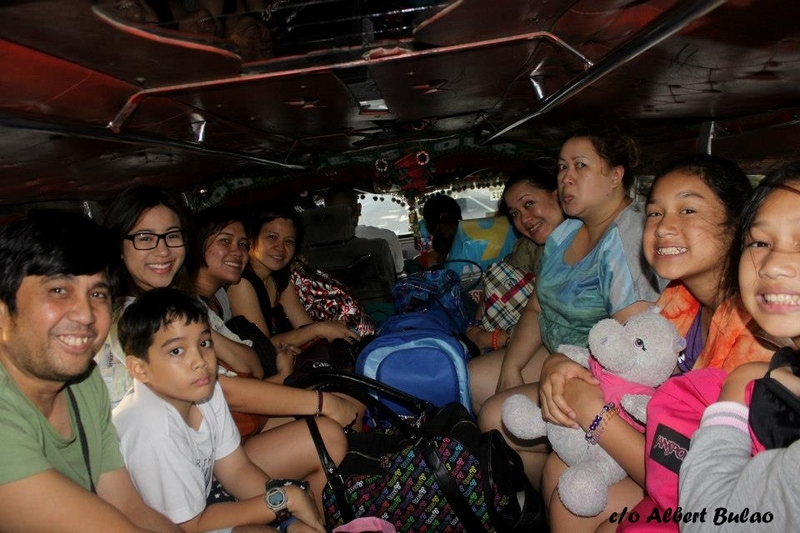 We were fetched by a jeepney arranged by the Ronville Resort, the inn where we will be staying. Ronville Resort is still about 10-15 minutes away from the port and it situated in the town proper. We have the whole place to ourselves. There are five rooms and each room can accommodate 4 to 6 people. After settling, we asked the staff to serve lunch already because we were so hungry. 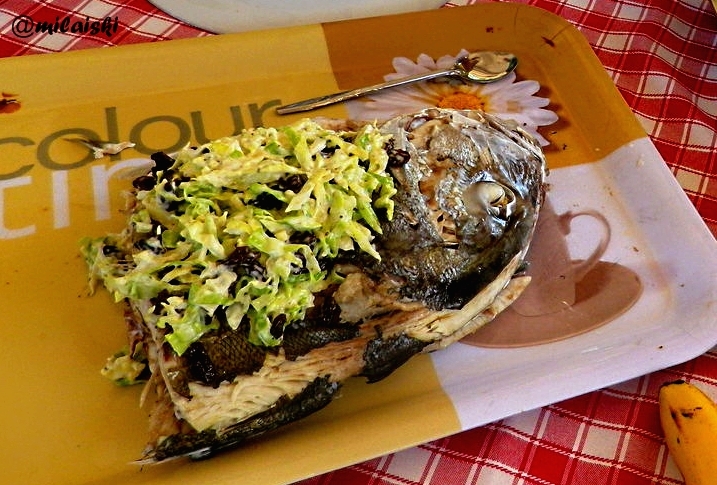 We were served a sumptuous menu of fresh fish, daing, bulalo and ginataang langka. Not just some any fish. After eating lunch, the guide gave us 30 minutes to rest and change to swimming clothes. At exactly 1:30 PM, we proceeded to the jump off point for the island hopping which was another 15-minute ride from the inn. Since there were 20 of us, our group was split into three groups. Jump-off point for island hopping. One might wonder where are the white beaches? Wait and see because they are eons away from the town proper. 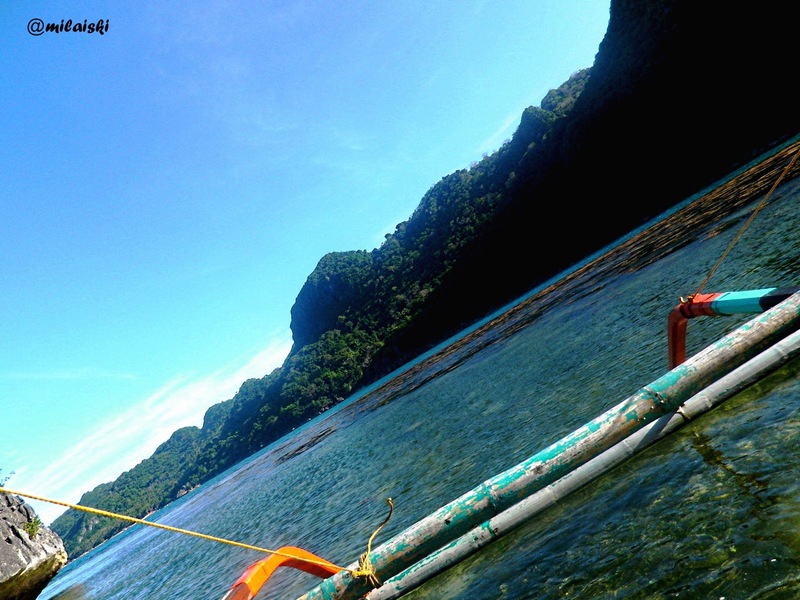 The boatman informed us that our first stop would be Matukad Island. I was expecting the boat ride will just be about 20 minutes. To my surprise, it took us about 40 minutes to reach the first island. The wave on the way were really no joke as our boat was rocking the entire time. 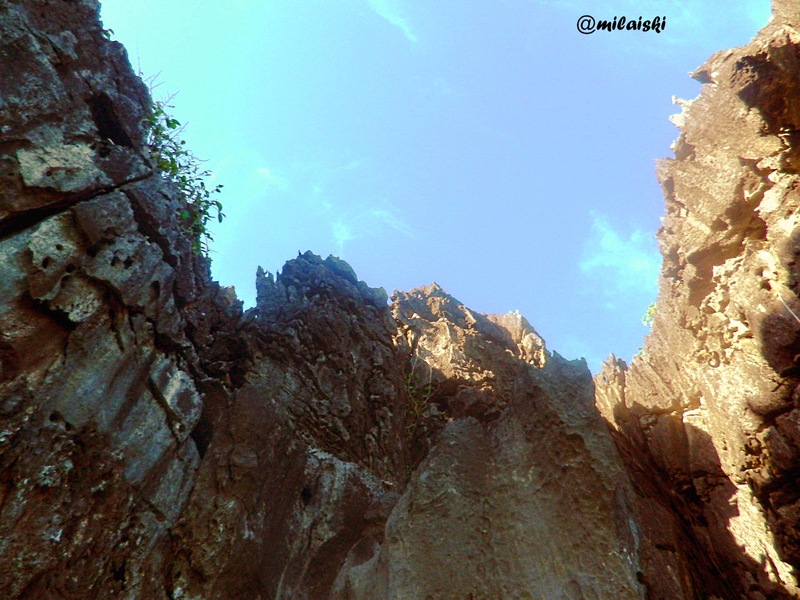 On the brighter side, there were scenic views such as rock formations and El-nido-esque cliffs on the way to Matukad. Great view from the boat. 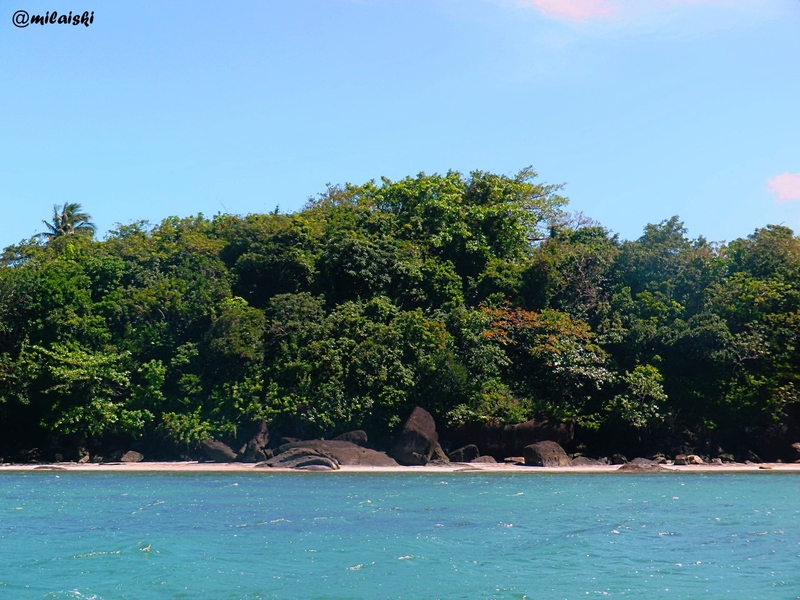 After enduring the harsh waves, we finally reached Matukad Island. 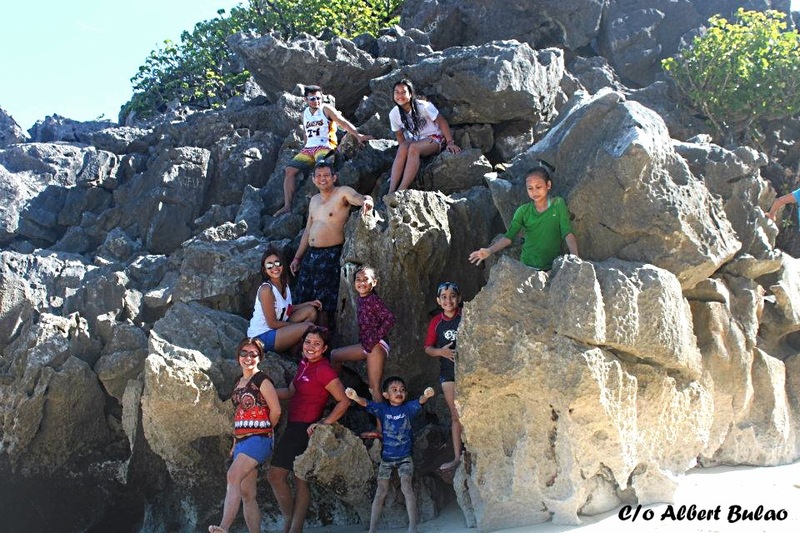 The island has a wide stretch of beach so it was perfect for little cousins and cousins-law. We decided to spend most the afternoon there since hopping from one island to another was a bit inconvenient for our large group. Panoramic shot of the shore of the island. Matukad has probably one of the most powdery white beach I’ve seen so far. It also has gorgeous rock formations. 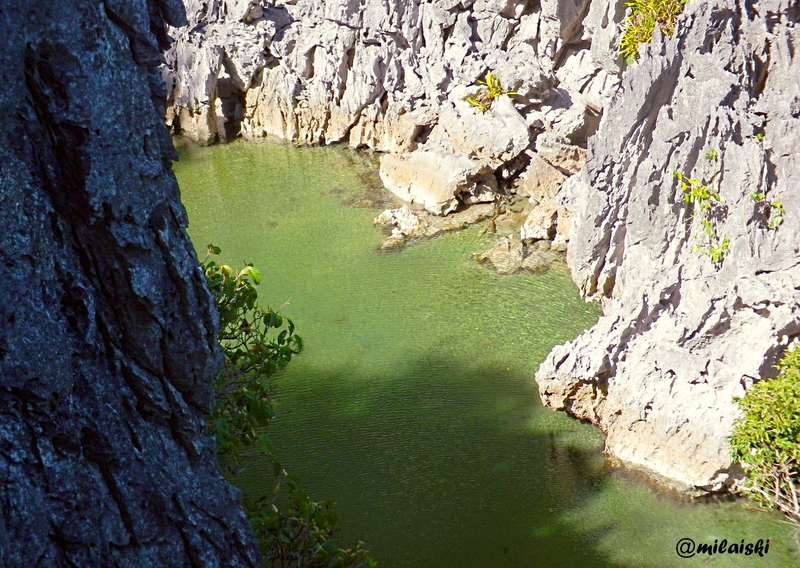 In one side of the the island, there’s a cliff that leads to a a legendary lagoon. Local folks say that a 100-year old milkfish lives in the lagoon and one should not catch it because misfortunes will happen to the person. Miko and I decided to check out the lagoon. The cliff was stiff but the guide wasalready familiar with the area so the climb was not really that difficult. 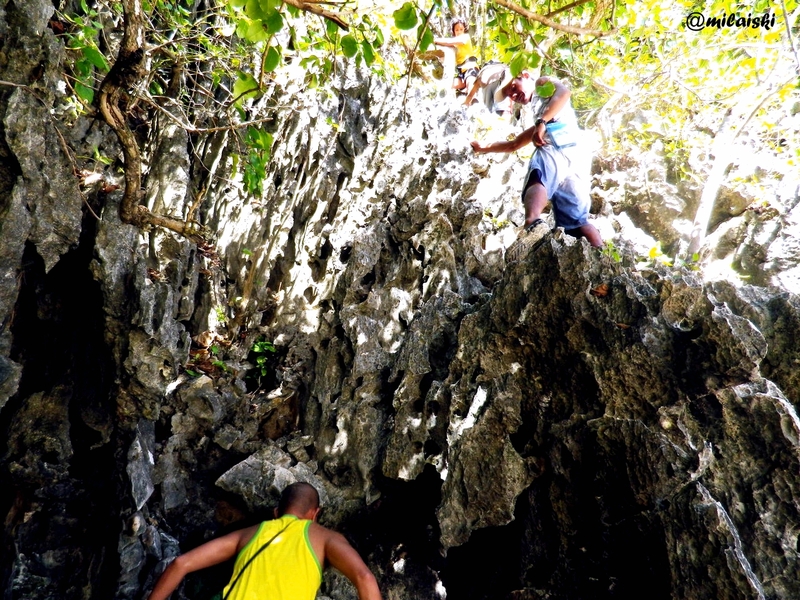 At the top of the cliff, one can catch a good view of the whole stretch of Matukad island. After the climbing down from the cliff, my aunt Ning ning, my cousin Aya and I decided to check out the beach and rock formations on the other side of the island. We had to pass below the cliff to reach the other side. The water was waist-level deep only but we have to duck our heads since there were sharp stalactites on the ceiling of the partial cave-like structure. 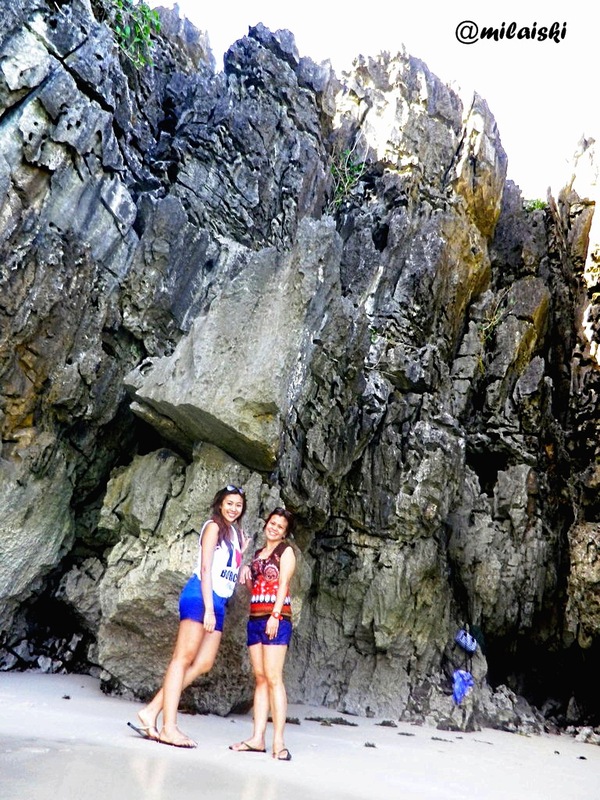 I was expecting more beaches but what welcomed us where more rocky cliffs. We then hurried back to the main beach because we know we had to leave soon. We enjoyed the rest of our time by swimming under the scorching sun and talking pictures with the rest of the family. At around 4:00 PM, we left Matukad Island. I was hoping we could drop by at the near Minalahus island but the boatman said it would be too dangerous for the boat since it was already low tide. 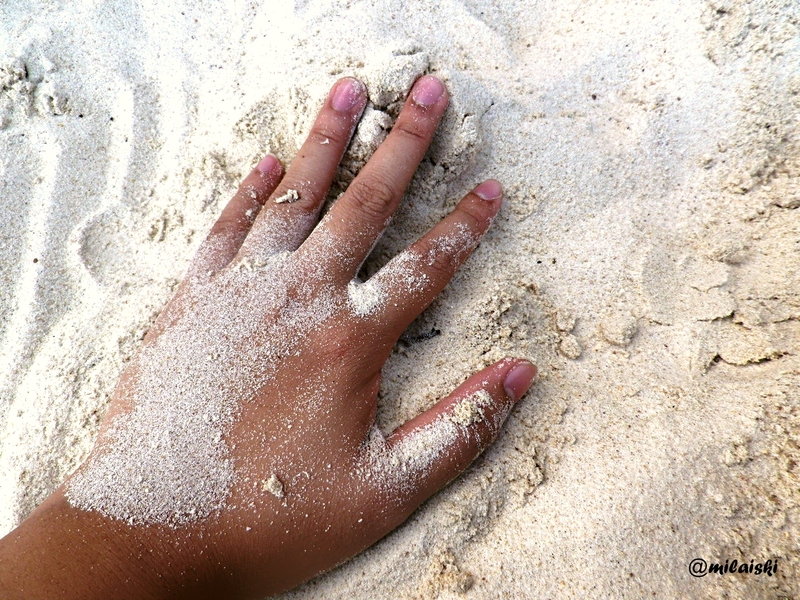 I had no choice but be contented with a glimpse of its creamy white sand. Minalahus island at a distance. Our last stop for the day was Cagbalinad Island. 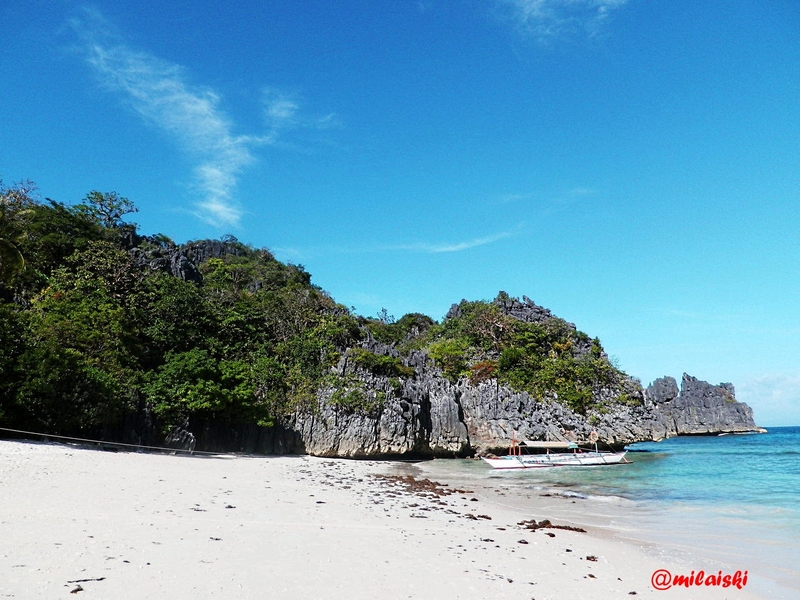 It was a smaller than Matukad but the sand was equally fine and the rock formations were also stunning. The water near Cagbalinad was also clearer but it was full of sea weeds. Water and sea weeds near Cagbalinad. 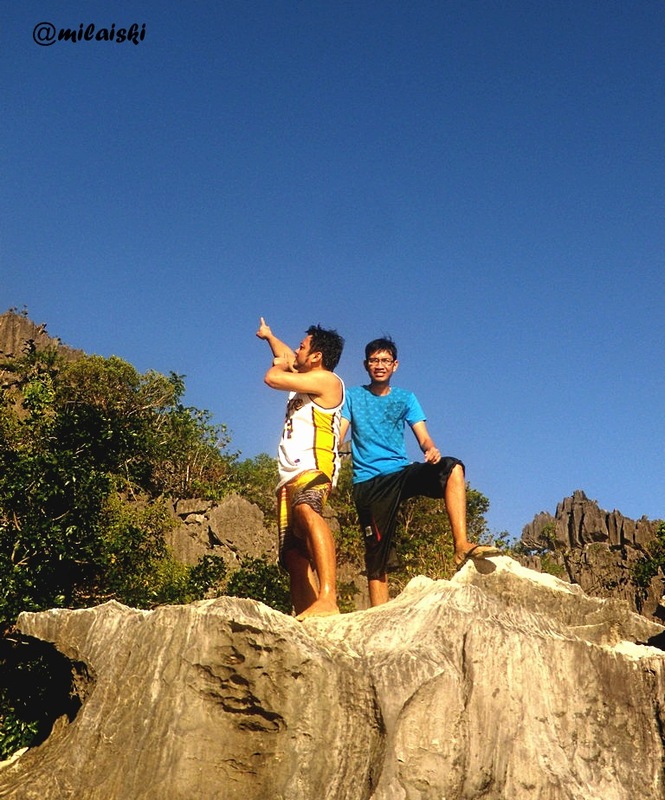 Uncle Isko and my brother RB on top of one of the big rocks. Across Cagbalinad is the famous Gota Village Resort. This where the crew of the Survivor TVs show usually stays. 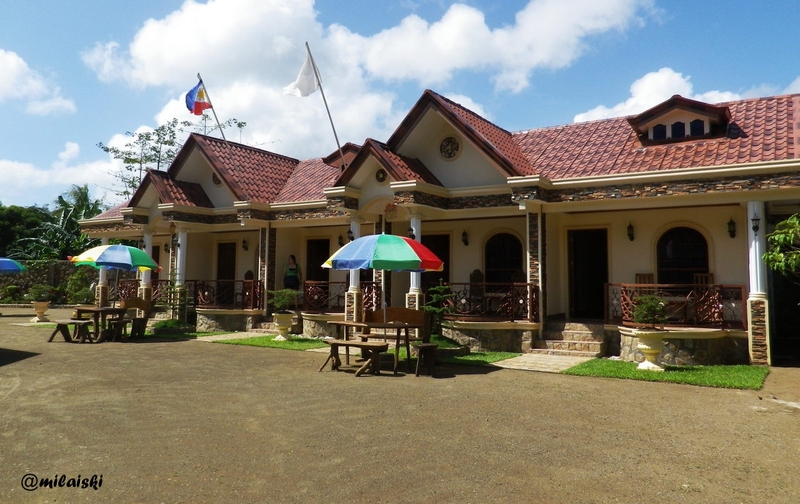 It is also I think the most posh among the different resorts in Caramoan Islands. 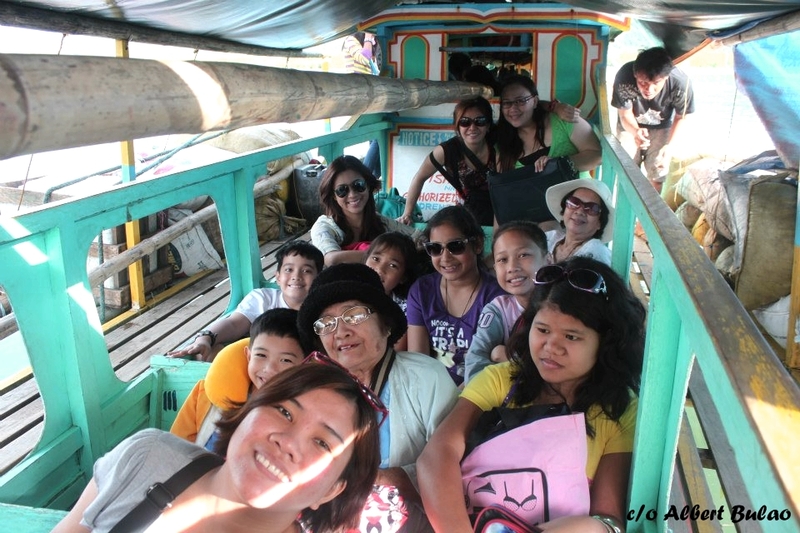 At around 5 pm, we left Cagbalinad island and hurried back to the town proper because the kiddos were already hungry. The view back was even more beautiful because of the effect brought by the setting sun. The sun about to kiss the ground. I just said to myself, “Man, I must be doing something good”. After eating, we went back to the inn to rest and and shower. Tons of food were served again during dinner. After dinner, I already proceed to one of the rooms because I was already very tired. Day 0 and 1 was jam-packed with traveling. Imagine I had to travel for 8 hours from Manila to Naga, 1.5 hours from Naga to Sabang, and another 2 hours from Sabang to Caramoan. But as they say, sometimes one has to experience terrible rains because he/she see a rainbow. 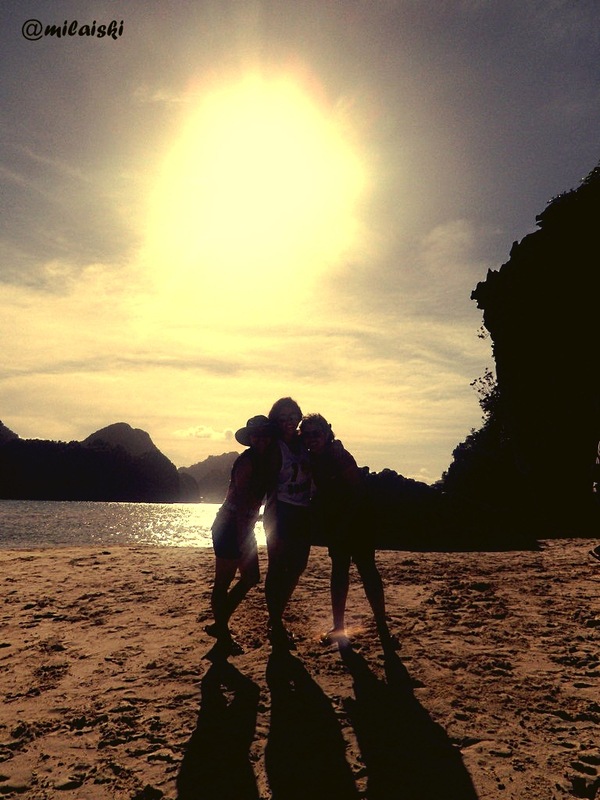 True enough, Caramoan keeps a lot of beautiful secrets. I may have enjoyed the island hopping more if I weren’t really that tired and the waves were not that scary. Nonetheless, this vacation was a new experience because it was my first time traveling to a far-flung place with my family and relatives. I am more guarded as compared to traveling with friends but nonetheless the amazement I feel every time I discover something new is just the same. I guess regardless of my companion, as long as I am in the moment, nothing else matters anymore. Please look forward to the second part of this travel diary! 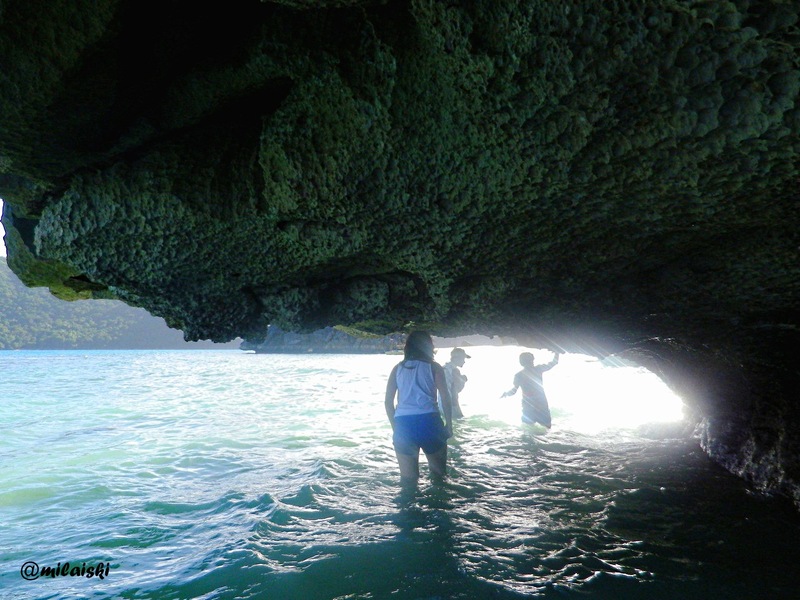 This entry was posted in Escapades, Family, Food, Outdoor, Photography, Travel and tagged beach, bicol, cagbalinad, Camarines Sur, caramoan, diary, escapade, food, gota village, guijalo, island hopping, islands, matukad, minalahus, naga, outdoor, philippines, photography, port, ronville resort, sabang, sunset, travel, white beach. Bookmark the permalink. I should include this one in my list. Can’t wait for be there. Yohoo! 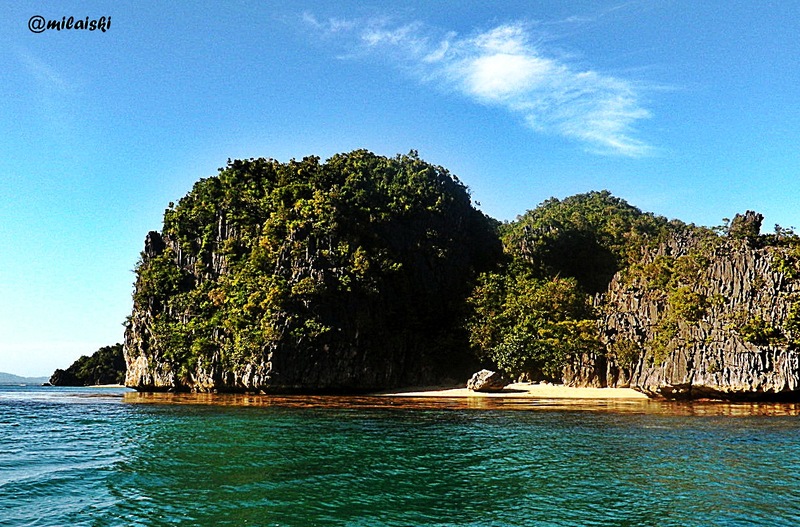 Caramoan wait for me. I’m sure it’s a nice place to enhance my photography. I’ll take note of that “milaiski”. Thank you for sharing this. It’s a great way for tourists to have a birds eye view what to expect in this great place! More developments are coming and more and more resorts are erected. 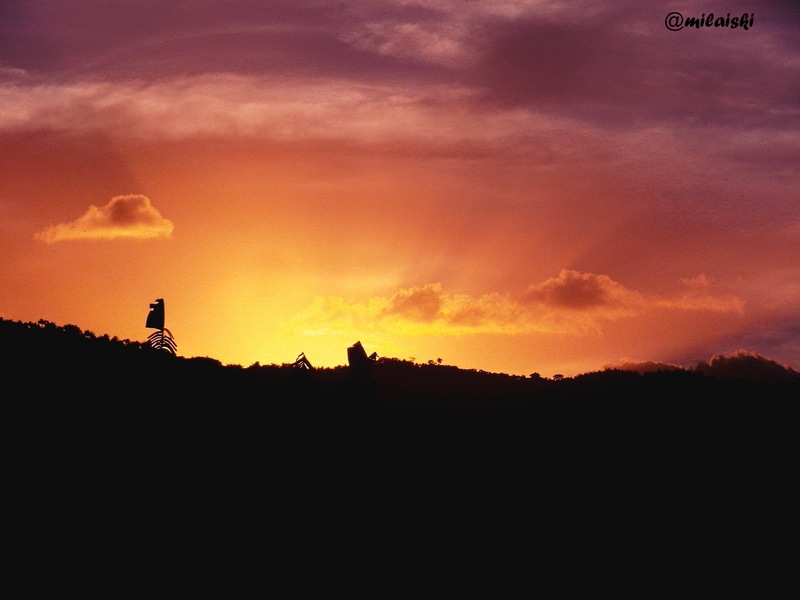 I personally like your sunset capture! AWESOME!